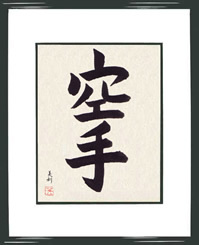 Kofukan helps you to learn Karate and master the art of Karate in its many effective variations and proven techniques. 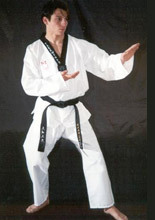 We have karate styles, uniform, articles and historical karate background information. The importance of impact training - A few year's ago some friends and I went to a demonstration to see some supposed "black belts" demonstrate their skills. I was very disappointed not to mention startled at how ineffective their technique was considering their rank. I should point out that these practitioners were not traditional karateka, but studied another martial art which will remain nameless! Learn to use your feet - Many new students have difficulty using their feet. I'm not referring to kicking in this article, I'm talking about footwork, positioning and dynamic movement. This is one thing that is difficult to master. Until you have it "under your belt" so to speak, you don't use your feet in the correct way and will be left frustrated and disheartened.